At The Walker Law Firm, PLC we treat our clients as people, not just as another account number. Our firm is different, and we hope you give us the chance to prove it. The Walker Law Firm, PLC is a full-service general practice firm with a concentration in criminal defense representing clients in virtually all legal situations. We are located in downtown Leesburg, Virginia . The Walker Law Firm provides clients with the information, guidance, experience, and personal service they deserve. We are with you every step of the way during your legal proceeding. Our Loudoun County lawyers keep you informed and answer all your questions. We are available 24/7 by email and return all your calls promptly. After-hour and weekend appointments are available as necessary. If you are looking for a people-first law firm whose lawyers are familiar with local practices and procedures in Loudoun County, Virginia and surrounding counties, please contact The Walker Law Firm today. If you need assistance with a criminal matter, a defense attorney from our firm will give you the straightforward advice you need in order to make the right decisions. 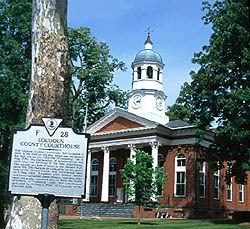 Our Loudoun County Lawyers are in court every day. We have the experience and knowledge needed to maximize your legal defense. If there is a weakness in the Commonwealth’s case against you, we will find it and use it to your advantage. Our defense attorneys do all the law allows to fight your charges. If the Commonwealth has a strong case and victory is unlikely, our lawyers have a high success rate in lowering the charges against our clients. This allows us to minimize the jail time and lower the fines. If you have criminal charges pending in Loudoun County , we encourage you to contact our firm. We are certain you will be fully satisfied with our services. If you have a civil matter you need help with, please contact us today. Many people become uneasy when faced with the prospect of walking into the courthouse, filing the appropriate papers, and finally getting in front of the Judge. This is what we do. Rarely a day goes by when a member of The Walker Law Firm is not in court before a Judge. Often, people have several questions about the civil process and those questions only increase once a law suit has been filed. The Walker Law Firm prides itself on getting back to their clients as soon as possible. We offer weekend and after hour appointments and can be reached by phone after hours and email virtually 24/7. We hope you consider The Walker Law Firm for your civil representation. Contact the The Walker Law Firm, PLC for assistance with all your legal matters. Give our firm a chance to exceed your expectations. The Walker Law Firm does not charge for a case evaluation. A small fee is charged for consultations relating to divorce/family law matters. The Walker Law Firm, PLC, All Rights Reserved, Copyright 2010.